We were practicing Olympic athletic events at school this morning in PE so I was very hungry come lunchtime and it didn't help that my year were second last in the queue! My sister and I were a bit nervous that we would get into trouble asking for fruit with our lunch today so Dad printed off an email from the council and my sister put it in her school bag. I had to ask for fruit and they were unsure but when they checked it was ok.
Today's Shepherd's Pie was really nice. The mash on top was really creamy and the mince was in lovely gravy. I wonder where their meat comes from. The salad was lovely and crunchy. The cake looked really difficult to serve because the icing was so sticky. I saved my melon until last and it was a great way to end my lunch. Miranda from the Unites States of America (1 second! Would have been longer but Miranda didn't mention where she is in the USA) has sent this photo of her lunch. She says its bigger because she is at High School for grade 9-12. Courses: All one course. We go up and choose what we want, and it is put on our (flimsy styrofoam) platter. Generally, we get one main course (the spaghetti) with a side course (the bread), a drink (the cocoa milk) and 2 mini-sides (the salad and gummy candies). Anything else is charged extra. Veggies: I took a salad, that's about 5/10, 14 mouthfuls. Miranda I have no idea what gummies are but I am glad you like them! What is very different is I think you bin your tray and fork where as ours get washed. Do you recycle them? It's sports day tomorrow and I hope tomorrow's lunch is as good as today's as we are racing all afternoon! Good job. I saw your work here in Brazil. Hi Veg. I am a teacher at a public school in Tennessee. We also use styrofoam and plastic at lunch, The trays and utensils all get thrown in the trash. We are very behind on reusing and recycling. I love your blog! With all due respect, as a teacher, isn't it your duty to lead change. I am so dismayed at the amount of waste in schools. Not only is the food the garbage, the packaging is also garbage! Foodservice in the United States is usually outsourced to a company. Since when is it a teacher's responsibility to "lead change"? The USA has made it clear in the media over the last 12 years that it has little respect and faith in its teachers. What about parental responsibility? Teacher are employees, and have quite enough to be getting on with and quite a difficult job without have to take up things like this. Yes, it is the potato. Shepherd's pie is a meat and veggie casserole with mashed potatoes baked on top. Gummies are like jelly babies, usually they come in a bear shape, but you can get them in all different shapes and sizes...they are not that healthy, but fun! Very interesting blog. Btw, gummies are similar to the jelly babies sold in the UK. Hi Martha, really great idea and a smart way to make things better! What do you think about packed lunches? Does your school offer them/would you consider it? My school food is generally amazing, but I'm a packed lunch user, so I don't get to experience these wonders... Today they had scones, cream and strawberries! Well, at least today's lunch looks like it might keep a 9-year old's tummy from rumbling for the afternoon. Well done, Veg!! "...how absolutely sad that children have to take an e-mail from home proving that they're allowed fruit for lunch..."
Since when have jobsworths been famous for communicating anything of vital importance to each other, let alone acting upon it? @Jaylah... I absolutely disagree. Either schools need to serve healthy food OR don't serve anything at all. Look at the Asian countries or Finland. They serve their children healthy food. The only excuse for bad food is that those in charge of food, care about profits over children. a) allowing this travesty to occur? b) depending on schools to feed their children? My wife is from an immigrant family. Both parents worked all day, yet they managed to always pack a lunch for their children. "No time" is not a valid excuse. "But how absolutely sad that children have to take an e-mail from home proving that they're allowed fruit for lunch"
I agree - this is so sad! This sort of policy completely confuses eating priorities. Growing up, I wouldn't have naturally always selected fruit over dessert, but if I had dessert, I likely wouldn't want fruit. Only once I got older did I realize that fruit is actually what my body wanted when I wanted sweets, not desserts or candy. I'm sad it took me making all of my own food choices to come to that realization. My daughter is 5 and has school dinners. We were invited to taste them at the start of term and they weren't too bad at all. I live in the state of Virginia, US. We are near Washington, DC. I'm very impressed by your blog - it looks like you are helping the adults to make some very important changes in your school. Healthy meals are necessary for growing kids! Your latest lunches look so much better than the first few you posted. My daughter is 18, in 12th grade - here, that's the last grade before going to college. She likes to take her lunch to school because it's healthier. They have pizza EVERY day as an alternative if you don't like the other meal, and can get subs and big salads if they want - but she says they are always soggy and not very nice. She likes turkey and cheese sandwiches on wheat bread, and like you - lots of fruit and salads. Keep it up! You are helping all your classmates. Hey VEG! This is Maria, from Puerto Rico (find it in the map, in the Caribbean). I also have a blog. What do you think of me writing about your blog and you writing about mine? Here's the name of my blog so you can visit mine and take a look: Maria's Adventure Blog. I post every Friday, and I am a huge fan of yours so I would like to do that. I'm 9 years old too. If your interested, please comment on my latest post with the info about the post. Hi. I love your blog! I read about you in Grist. Can I interview you for my blog? It's called Success & Chocolate. I interview inspiring girls and women. I would email you a few questions about why you think you're so successful...and I'll also ask you what kind of chocolate you like, just for fun! Hi, it's me again. I ran out of space on the last comment. If you'd like to be on my blog, please visit my Facebook page and leave a message. FB.com/successandchocolate Thank you! I'm a Canadian expat living in London. I found your blog through a Toronto newspaper. Really great! In Canada there are no school lunches but usually there is a cafeteria in high schools where you can purchase lunch. I went to Japan to visit a friend years ago who taught English and when I accompanied him to work I found out about their school lunches. We had a tasty lunch that day but my friend reckons it was because there was a guest. Keep up the good work. This is the best I've seen yet. Shepherd's pie is one of my favourite things - we have it here in the States too. Is yours lamb mince or beef? Here in America, it's nearly always beef - lamb and mutton aren't really properly appreciated in this country. P.S. : That salad is a VAST improvement. The PC UK keyboard layout has the "£" symbol on the 3 number key and is typed using Shift+3. On a US-International keyboard, the "£" can be entered using Shift+AltGr+4 or Shift+Ctrl+Alt+4. Under Microsoft Windows it can also be generated through the Alt keycodes 0163 and 156, and in MS-DOS by Alt-156. The symbol "£" is in the MacRoman character set and can be generated on most non-UK Mac OS keyboard layouts which do not have a dedicated key for it, typically through Option+3. On UK Apple Mac keyboards, this is reversed, with the "£" symbol on the number 3 key, typed using Shift+3, and the number sign ("#") generated by Option+3. I really like your blog! It's a great insight into the lunches they serve at other schools. I find it weird that you are not allowed unlimited fruit or veggie! It's been two years since I have been high school (in Uni now), but still remember that you were allowed as much fruit and veggie from the salad bar as you wanted. Of course, my school was sort of special in the way that we had many, many different choices to choose from. We had the regular cafeteria food, then we had a small store that served crisps, yogurt parfaits, and ice cream among other things, and then we had the student store. The student store served food that was not provided by the school itself. The store was run by students, mostly those in DECA (the business class/club) and the proceeds earned went towards getting the food items. I was lucky to be in a school district that concerned themselves with making food healthier. I was able to experience a change in food throughout my school career. I remember in first grade (I believe year two over there, for 6-7 yr olds), the pizza served was square and the cheese could be taken off the pizza, rolled into a ball, and bounced. The hotdogs in the first few years of elementary school were also green. Luckily, around my 7th grade year, they started making the food healthier and it was much better! I wish my school food looked half as appetizing as yours. We have soggy bread that everyone has learned just to throw away, a "meat" yeah my friends and I have debated if its real or not, a milk, and you can get either a fruit or veggie( I usually get neither). Most of my friends haven't eaten school lunch since 6th grade(7th year) because it was required to get a plate. it6 seems you where at school yesturday. I thought 28th May was a Bank Holiday in Scotland. Any way here is my lunch yesterday. I learned about your blog via a weekly e-newsletter called This is True. It is a wonderful blog. You write very well and every entry had me interested. I can't remember my school lunches before secondary school, which was in the 1960s. They were certainly larger than yours, but with much less imagination and never any choice that I can recall. No fruit or salads. Desserts were usually custard on something or semolina (yuk) with a teaspoon of jam. I grew up in England, and moved to New Zealand. I can't tell you about NZ school lunches because my children always took a packed lunch from home. Hi Veg, I enjoy reading your blog. Asking where your food comes from is a great idea! You could work out how far each item of food has traveled from where it was produced to get to your school. I'd love to hear about the "food miles" for each of your meals. Hi from Germay and congrats for everything you have achieved! it is more then wonderful what you did. Keep on blogging! Like Bill I came here via the This is True newsletter(your story was featured in it). Also like Bill I can recall our lunches were a bit larger than yours used to be. However, my school was a a k-12 school and except for the really young ones(K and 1st grade if memory serves) we all got close to the same thing. I.E. the little ones in second and third usually couldn't finish and once you were a in high-school it was like half a meal! Really cheap though and there were days were even the 'always paperbag' crowd would eat the schools(or try to trade their bag for a tray). Sadly that only happened about once a month. Usually it was a large tray of potatoes(baked and/or mashed) absolutely covered in home-made chicken noodles with a fruit side and drink of your choice. All for a dollar and 25cents(and this was only a little over half a decade ago, I think it is a dollar and 75 cents now for the same portions). Anyways we all used to joke that the reason the school did this was because they didn't want to be thought of as being a part of the obesity epidemic. They could say 'see we give them super small portions, they can't possibly be obese because of us!'. I was sent a link to your blog from Germany this morning (I'm in the Netherlands where I live with my German wife and German/Scottish/Dutch kids), and I can't tell you how much I admire and enjoy what you're doing here, VEG. Whatever you choose to do with your life, I don't doubt for a second that you'll be a huge success. You've really made me smile and I wish you the very, very best of luck with this blog - I think it's going to make you a very famous and important person before all is said and done. This latest meal certainly looks a lot better than those first ones you put up! I went to a very small primary school and there were usually seconds of some things if you wanted it. Except when it was dessert- then everyone would want extra so they used to give it to the teachers! This is a really nice blog, I must say. 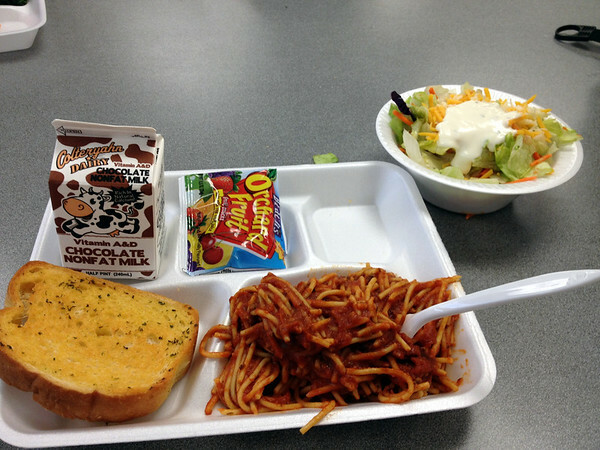 My school cafeteria days are over, but I must say that your lunches look much tastier than ours did back in the day. Although ours were bigger, I think, but we were high schoolers so that might be the reason. We would get a soup serving, and then a choice of two or three main courses that would be traditional canteen-style food. Usually not very good, but there were exceptions. Occasionally we would get a cake or a banana or an apple, but not more than once a week. Still this was better then food in the other canteen we could go to. (we were three highschools next to each other, and everybody could go to canteen of any other school). Price was about £1,50, the rest was paid by the state. BTW. I am in Kosice, Slovakia but I dont think that is on your globe. Awesome looking lunch today! Love it that you are blogging about healthy eating at school because there is nothing more than a girl who loves her food! I've left school too long to show you what I ate when I was a kid, but I definitely had more vegetables than what your school serves! Keep it up!! I'm from Brazil, but I've already lived in England. I just came to say how touched I am by your initiative! It just proves that each one CAN make a significative change around them. (And with the internet, you've reached the world, darling!). Hope this blog continues to be spread all around the world in order to improve EVERY children's meal. All my support and best wishes to you! Nice blog, great job exposing the slop our schools serve our kids. Anxiously awaiting your lunch photo for May 29! Hi, my name is Paula. I am 12 and i`m from Bilbao (Spain). I like very much what are you doing in this blog. It is very unusual that a girl of your age did a blog like this but, keep it up!!! We are currently in California, US, but have moved around quite a bit. My kids are in 11th, 7th, and 5th - or at least they will be when school starts again. They're not big on eating in the cafeteria, unless the meal of the day is pizza. When we were in Korea and my kids went to school on post the high school kids had "open" lunches and were allowed to go off-campus for lunch. Most of them ate at Burger King and Popeye's. When they take lunch from home I send a main course (either a sandwich or spaghetti-o's/ravioli), gatorade, bag of chips, fruit cup, yogurt and a desert. Sometime's I'll add fruit roll ups or fruit snacks. Love your blog!! Must say though that I would like to comment on Miranda from America's lunch. I am a lunch lady in Massachusetts and we make pasta at least once a month. I find it very unlikly that there is any dye in the spaghetti. Tomato sauce just naturally leaves stains on thing. There are so many regulations about what is allowed to go in school lunches over here and dyes are a big no-no. I have enjoyed your site so I've nominated you for the Illuminating Blogger Award for illuminating, informative blog content. You can check out the details at my site ... http://foodstoriesblog.com/illuminating-blogger-award/ ... Hope you're having a great day! Mirandas Meal is not very good here at all. As for the Gummies .... really !!!!! Sweets _and_ sugary drink? Crazy - and so irresponsible of whoever is responsible. I find that home-made spaghetti sauce can often stain, though, just because of the concentrated tomato. So I hope that pasta sauce isn't genuinely dyed. If it is, that's ridiculous. 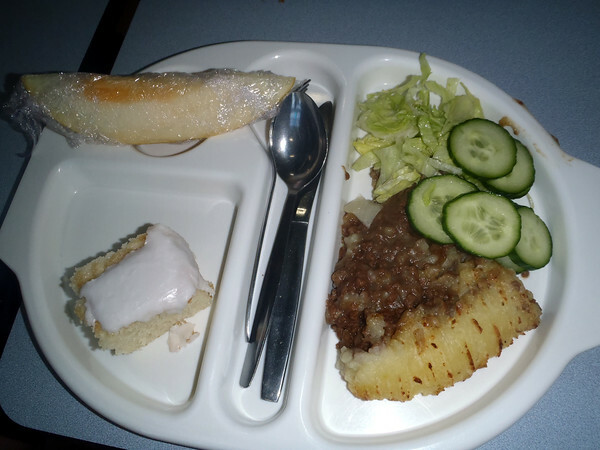 I am quite shocked to see that in a lot of schools they use disposable plates and cutlery! In this day and age we should all try to reduce the amount of rubbish we create. To see that a school, which should educate children, is not trying to make an effort to protect the environment, is very sad. Your blog is very nice, though - and I think your school lunches don't look too bad at all! Brilliant idea... Children from all schools should be able to rate their meals, to keep the quality and variety up. I would urge you and others to keep it up. As a parent it's nice to see what children are being served although their are some disasters there are some pretty good meals which you have rated 10/10. As adults we rate our meals an have no issues complaining in resturants if the food is not to a good standard. So why can't Children? Australia gots no trays. No gummies. No tables. No chairs. Parents make their kids' lunches every night before school the next day. The bad parents send their kids with money every day to buy meat pies, hot chips, lollies and coca-cola, but that's ok for them because none of the family has teeth anyway. Why are other countries so whingey? Is Australia the only nation that does things for themselves? Right on mate !! Always took lunch from home and ate outdoors on one of the Sports fields in the fresh air and sunshine. Our schools never had Canteens or catering facilities, besides a small Tuck Shop. It was a ' Once a week ' treat to buy a Meat Pie and Candy bar from the Tuck shop. Cool blog, sad to hear about the photo ban but maybe you could keep it up with words and ratings only? PS: I googled "Colteryahn Dairy" from the milk label and it's in Pittsburgh, Pennsylvania, so chances are Miranda's lunch is from western Pennsylvania or West Virginia. I really like your blog! Well done my friend. Miranda's meal reminds me very much of the school lunches I grew up with. I graduated grade school about 10 years ago, but it doesn't look like much has changed from this photo. It makes me sad. Too much processed, preprepared food with food dyes, added sugar, and additives. What vegetables there were have been picked unripened and shipped across the country. The result is tasteless veggies with little nutrition drenched in some kind of processed food dressing. Anyway, the good news is that there is a food revolution going on here. It's just starting where I live, and I'm hoping it is catching on solidly. From some of the other US school lunch photos, I think people are starting to catch on in other parts of the US that whole food is good food-and good for you too! I am from Salt Lake City, Utah.